Jim Parsons (Sheldon), Johnny Galecki (Leonard) and Kaley Cuoco (Penny) have been especially well remunerated. 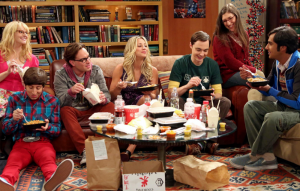 The overall salaries of the Big Bang Theory cast may have been revealed. Following news that the hit US sitcom has been renewed for another two seasons, Vulture estimated the actors’ total salary haul by the end of season 12, which will air in 2018-19. It is estimated that Jim Parsons (Sheldon), Johnny Galecki (Leonard) and Kaley Cuoco (Penny) will have taken home total salaries of $140 million (£111 million) each by the end of season 12. Meanwhile, newer cast members Mayim Bialik (Amy) and Melissa Rauch (Bernadette) will have taken home an estimated $28 million (£22 million) and $31 million (£25 million) respectively. Vulture points out that the actors have probably negotiated a cut in the show’s back end revenue too, meaning they will earn even more money from DVD sales, merchandise and syndication rights in the years to come. It was recently reported that the five original Big Bang Theory cast members – Parsons, Galecki and Cuoco, plus Kunal Nayyar and Simon Helberg – offered to take pay cuts so Bialik and Rauch could have a rise in seasons 11 and 12. The show’s enduring popularity has also led to a prequel spin-off series called Young Sheldon being commissioned by CBS. The post The massive total earnings of the ‘Big Bang Theory’ cast have been calculated appeared first on NME.